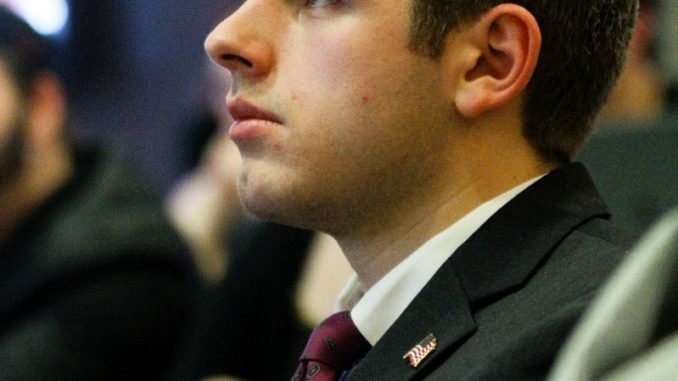 Turning Point USA, a group of Republican college students at Wittenberg, brought Grassroots coordinator David Conte of the National Rifle Association (NRA) to address the Witt community. “It takes a lot of courage to stand up for what you believe in, especially on this campus,” Grant Steele, ’20, Turning Point executive member said to preface the presentation. To accompany Steele’s introduction, students and faculty filed in silently, lining the perimeter of the room. Students wore orange bandanas and held orange roses to represent the color of non-violence- as part of their protest. The GroupMe consisted of 61 people and nearly 31 members, faculty and staff included, that protested the event. Riddle, as a member of Witt Democrats, who weren’t affiliated with the walkout, discussed how she and the rest of Witt Dems have done extensive research on Turning Point and the NRA and the tactics that they use during these kinds of presentations. Before his presentation started, Conte acknowledged the protestors, noting that after he spent some time overseas getting his education, it was refreshing to see American’s exercising their right to freedom of speech. “This is what America is all about,” Conte said. During the presentation itself, the protesters stood in silence while Conte gave a brief history of the NRA, debunked several common misconceptions about guns and gun laws and discussed some legislation both in the works and that the NRA has supported in the past. The NRA was founded in 1871 when the Union Army was in search of a way to better their military training. From there, the NRA passed the National Firearms Act, requiring registration of fully-automatic rifles, the Gun Control Act of 1968 and the Political Victory Fund (PVF), the NRA’s political PAC. During the 2016 election, Conte was unsure of which candidate the NRA was going to back, as they are a non-partisan group. After an impressive amount of support from the Amish in the state of Ohio, Conte immediately knew where the NRA’s support would fall. Going off of the 2016 election and the fake news phenomenon associated with it, Conte commented on the difficulty he’s had in the past having conversations with people about guns and gun laws. “Conversation has gotten way overheated…I hope that it’ll dial down at some point so that we can talk to each other as humans,” Conte said. Conte went on to debunk myths that have been made popular by the media, including arguments about gun free zones, the gun show loophole and that more guns equates to higher crime rates. According to Conte, 96.2% of mass shootings have occurred in a gun free zone. The speaker went on to explain gun free zones in schools. As far as gun shows go, less than 1% of criminals acquire firearms from gun shows and, if they do, they must undergo a background check with the seller. If either party is found unable to own or carry a firearm for whatever reason, the customer isn’t allowed to purchase the gun and the seller isn’t allowed to continue to sell. Criminals go about illegally obtaining guns in two different ways: theft and straw purchases. A straw purchase is when an individual with a known criminal record will employ someone, without a criminal record, to go and purchase a gun for them, knowing they’ll pass a background check. “Both federal and state governments need and should be doing more to prevent straw purchases,” Conte said. At this, several protestors later commented on the lacking credibility of the speaker, claiming that Conte used statistics that sounded good and showed graphs that looked good, but that lacked credibility and didn’t cite a source. “I was taught in my experimental design class how to make the data look more believable than it actually is,” Danielle Balchunas, ’21, said. One of the major qualms that the protestors had with the presentation was the pointing of fingers at the mentally disabled. While Conte said that the NRA will back legislation that promotes bettering mental health services, but they won’t donate any of their own money to the cause. “They used their fair share of gas lighting terms to point to mental health as the issue here,” Riddle said. I was glad to see some protestors actually adding to the conversation but most didn’t. They didn’t want dialogue they wanted to grandstand. I would’ve appreciated the torch coming to more turning point members for comments but I’m not surprised. There should be more representation and comments from Turning Point members. By only taking a statement from the president and misrepresenting Mr. Conte whilst giving the other side the ability to give opinions is frankly insulting. I would hope The Torch can learn from this and try to present ideas without preferential treatment.